facilitates the movement of immune cells from the blood into tissues through the endothelial cells. 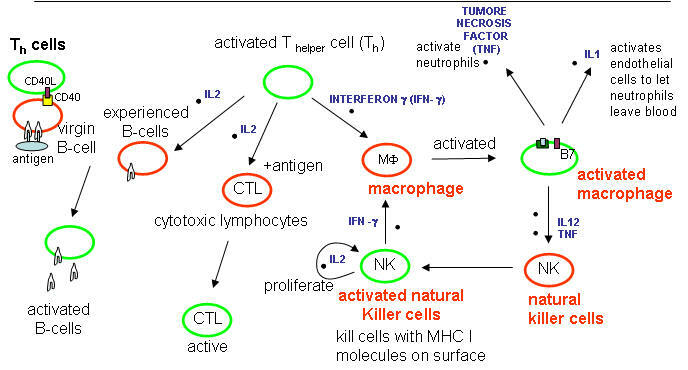 activates neutrophils activates macrophages which leads to IL1 secretion kills some tumor cells. Leads to release of INF-g from NK and T cells. Interferon a, b, w : Are produced by virally-infected cells. cause cells to degrade mRNA which kills virally-infected cells. The enzyme involved in RNA hydrolysis is inactive until the cell becomes infected with a virus. This protects uninfected cells. leads to the proliferation of NK cells and T and B-lymphocytes that have been activated by antigen exposure. increases the activity of other T cells (CTLs, NK cells. principle way to activate macrophages. IFN-g stimulates the differentiation of T4-lymphocytes into activated T helper cells.